Star Wars: The Force Awakens (2015) Directed by: J.J. Abrams Writers: Lawrence Kasdan, J.J. Abrams, Michael Arndt Stars: Harrison Ford, Daisy Ridley, John Boyega, Peter Mayhew, Adam Driver, Carrie Fisher, Anthony Daniels, Mark Hamill, Run Time: 135 min Rated: PG (Canada) PG-13 (MPAA) for sci-fi action violence. 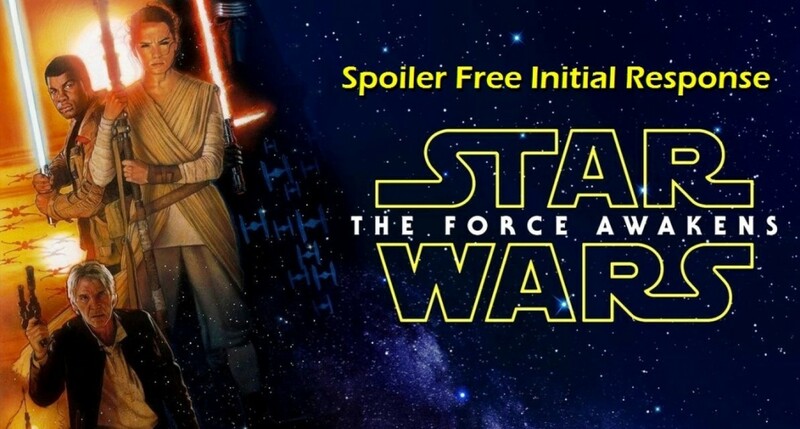 Write something spoiler-free about Star Wars: The Force Awakens? Challenging, it is. But here we go! Set 30 years after the events of Return of the Jedi (1983), J.J. Abrams—the film's writer/director—along with Lawrence Kasdan, the writer of the screenplays for The Empire Strikes Back (1980) and Return of the Jedi, provide a Star Wars film that looks and feels both old and new. Echoes of the original trilogy haunt the unfolding story of this highly-anticipated film as the plot draws new characters into an intergalactic conflict and their small lives explode with action and adventure. 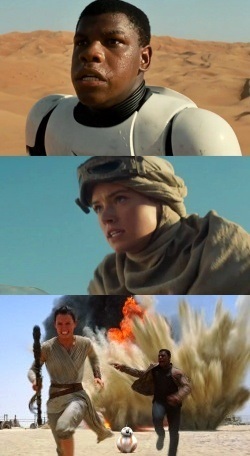 After deserting his post, a young man (John Boyega), raised from childhood to be a Stormtrooper in the First Order, ends up on the run with a streetwise scavenger named Rey (Daisy Ridley) and her newly-acquired droid BB-8. The First Order is the resurgence of the previously defeated Galactic Empire once helmed by the Emperor Palpatine and Luke Skywalker's father, Darth Vader. The First Order has all the familiar trappings of the old Galactic Empire: white clad Stormtroopers, the officer uniforms, the Star Destroyers, and the TIE Fighters, but a fever-pitch zeal replaces the past’s often banal bureaucratic colonialism as the First Order’s mysterious leaders work to reclaim what was lost at the hands of the Rebel Alliance. Is The Force Awakens purely nostalgic? Abrams manages to deliver a film that uses nostalgia to propel an ongoing story in a way a movie like Jurassic World (2015) did not. If there were no other Jurassic Park movies after this past summer's Jurassic World the film would simply stand as a fun stroll down memory lane. The Force Awakens truly whets the appetite for more and opens up a new story begging for resolution. For regular film goers, The Force Awakens is more like last year's Mad Max: Fury Road (2015) than Jurassic World. Both Fury Road and The Force Awakens succeed in capturing something more than mere nostalgia while re-establishing their respective franchises. While Jurassic World’s Chris Pratt is very charming, the film essentially gave the exact sum of its parts. On the other hand, movies like Fury Road andThe Force Awakens transcend the sum of their parts. 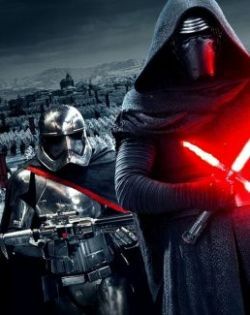 The Force Awakens has some general plot weaknesses scrutinizers will pick apart in the weeks and years to come. 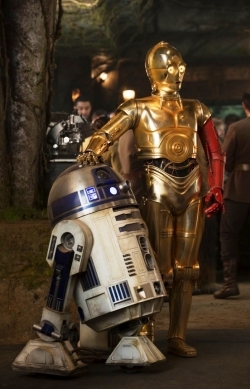 However, its strengths are in how it handles the concept of myth within the Star Wars universe, its expansion of the concept of the Force, and its continuation of the family saga which became the backbone of the original trilogy: A New Hope (1977), The Empire Strikes Back (1980) and Return of the Jedi (1983). These three topics are worthy of more in-depth consideration, but unfortunately require significant spoilers to dig into them. Watch for more analysis in a couple weeks. For Christian viewers intrigued by the idea of a family saga stretching over generations, The Force Awakens may provide encouragement to read Genesis11-50. It’s the account of Abraham's family as it twists and turns down the years from Abram to Joseph and Joseph's eleven older brothers (the children of Israel). Readers encounter a family struggling to love each other and do what is right, episodes of antagonism and reconciliation, tragedy, joy and complex relationships between young and old heroes in the faith as the hand of God works in their lives driving towards the fulfilment of a promise that would bring peace between God and humanity in the eventual life, death and resurrection of Jesus the Christ. Is The Force Awakens the best film of the year? Probably not, but it is a genuine, bona-fide Star Wars film and fans have waited a long time for such a film. For the most part the acting is better than in the original trilogy and the true standout in The Force Awakens is Harrison Ford reprising his iconic role as Han Solo the rogue smuggler. 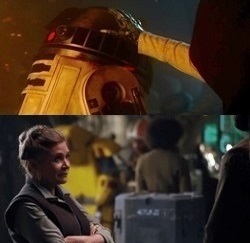 What about Princess Leia Organa (Carrie Fisher), now general Organa, and Luke Skywalker (Mark Hamill)? There's not much to say without spoiling the film. However, seeing them on screen along with Han Solo, Chewbacca (Peter Mayhew), C3-P0 (Anthony Daniels) and R2D2 was a real treat. For both new and diehard Star Wars franchise fans, before and/or after heading to the theatre to see The Force Awakens watch the original trilogy to see where it all began a long time ago in a galaxy far, far away.